Easily move water through your statue or fountain using the Little Giant Direct Drive Pond Pump. This lasting, submersible unit is specifically crafted to meet the demands of your small water feature, falls, or fountain. Designed to run only when fully submerged, this pump will move up to 170 gph of water for a lovely statue or fountain. Its screened inlet protects the direct drive motor from debris, and its versatile design enables the unit to be placed in any orientation. The volute can be repositioned as well, for even more placement options. The outlet accepts 1/4" FNPT fittings, and two holes on the back of the pump accommodate screws for added support. The durable housing resists corrosion, and the permanently sealed motor is cooled by the water surrounding it for consistent running. Its 15' long cord offers versatility in placing the pump, and its grounded, three prong plug keeps the item safe. 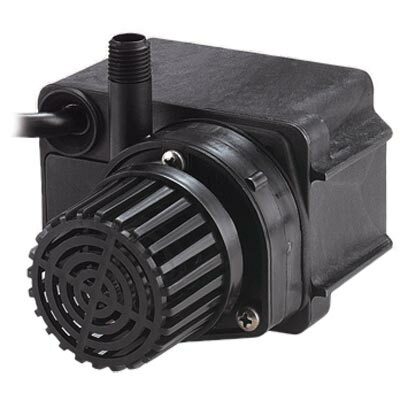 Power your statuary fountain or waterfall with this Direct Drive Pond Pump. Three year limited warranty.